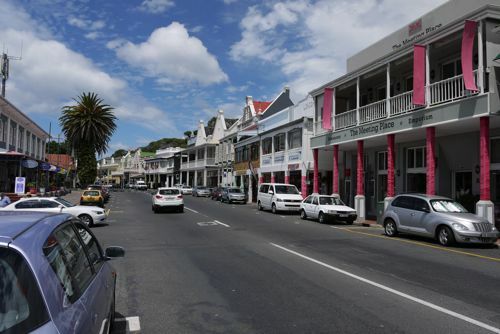 Cape Town is an outdoor lover’s dream with a temperate climate, long stretches of beaches, mountains and a myriad of hiking, biking and walking trails. 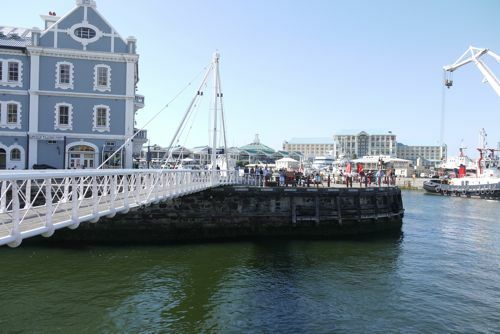 We started and ended several of our days with a walk through the city ending at the Victoria and Alfred Waterfront. This working harbor has bustling docks, luxury yachts, sailboats, tour boats, fishing vessels and even a ferry. 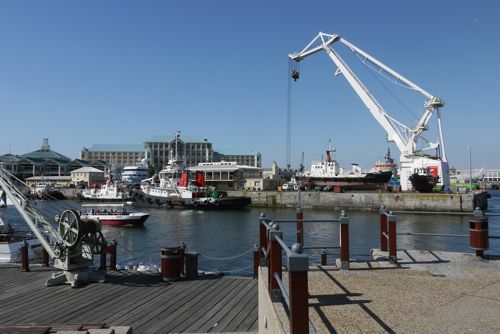 Along the wharf is massive development including the premier mall in South Africa, numerous restaurants, residential homes and hotels. 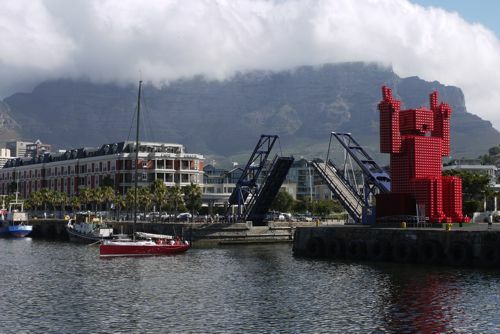 They have developed the waterfront to really welcome people to Cape Town. During the summer there are concert series at the outdoor amphitheater and live music on a daily basis from local performers. 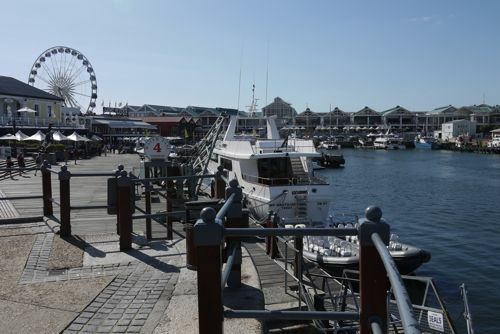 We rented a studio apartment just a few minutes from here and used the V&A Waterfront as our hub for exploring the city. With all of our lifestyle amenities and more (groceries, movies, artisan bakery, cafes, etc.) within walking distance it was a nice pace of life to enjoy for a week. 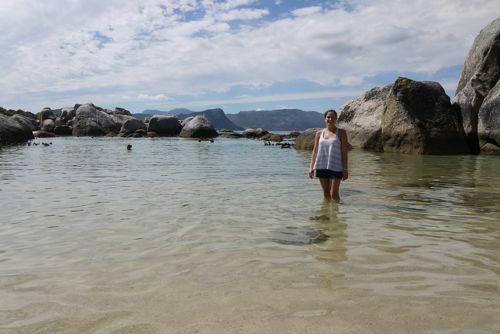 Just a short drive away we explored the Cape Peninsula. Driving south down the eastern side of the Cape you follow the sea all the way. Almost this entire area is included as a continuation of Table Mountain National Park. 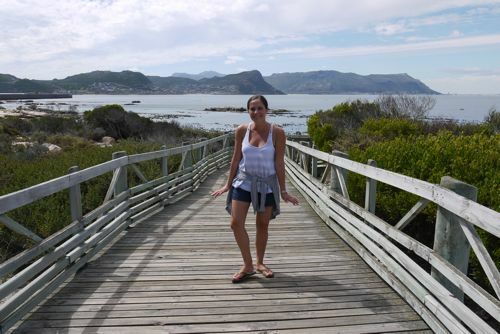 Our first pit stop was Muizenburg, a small town just north of Simon’s Town. We stopped by for the obligatory photo op of the colorful huts lining the beach. For just a few dollars you can rent one of these colorful houses to use at your private changing room for the day. When the weather is right, there is also a great surf school located on this beach. Just a few miles further along the sea we reached Simon’s Town. 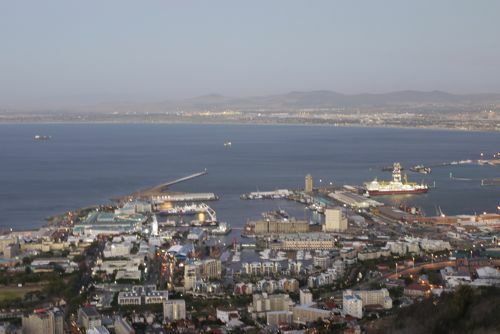 Simon’s Town is home of the South African Navy. A charming beach side town with stunning views of the bay. 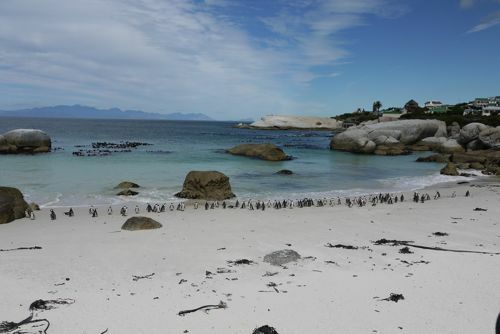 Almost adjacent to Simon’s Town is Boulders Beach. 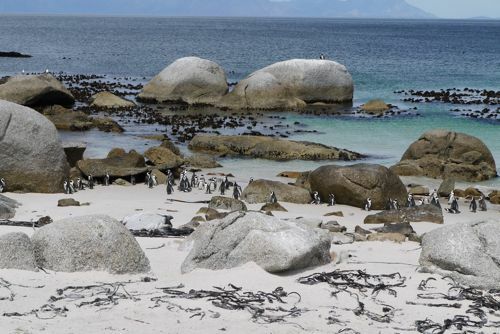 Boulders Beach is a beautiful secluded beach that has been taken over by African penguins. The beach is made up of sandy coves nestled between granite boulders, from which it gets its name. 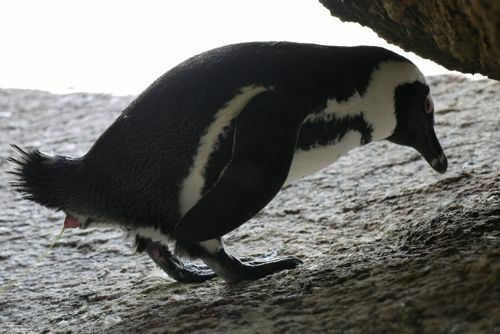 Only since 1983 have penguins called this stretch of beach home. 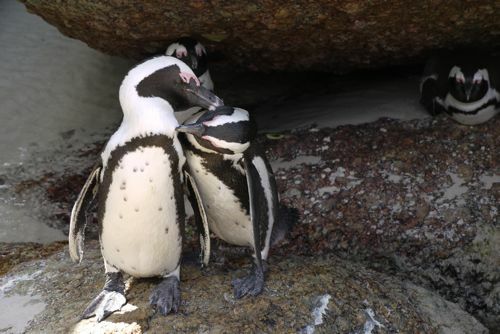 In 1983 a pair of African penguins were spotted on Foxy Beach at Boulders. 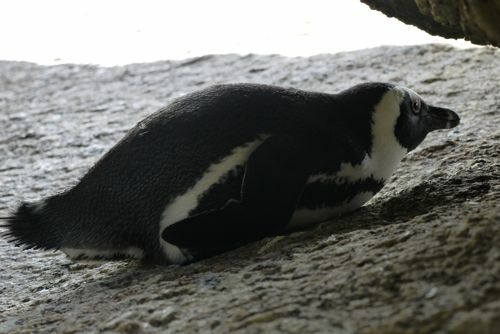 In 1985 they began to lay eggs here and since then the colony has grown rapidly. There are now over 3000 adult birds in this area. 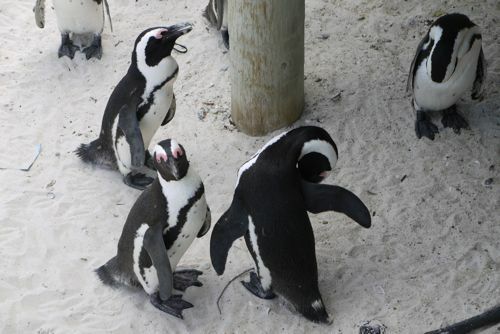 We enjoyed the best views of penguins from Foxy Beach, where the national park has constructed boardwalks leading you close to the birds on the beach. 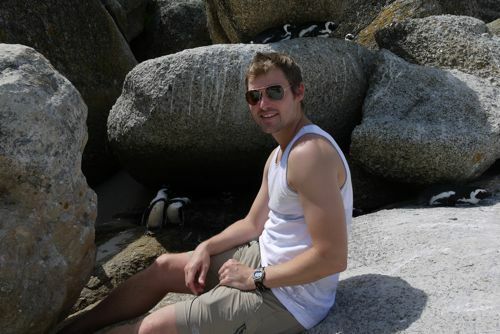 At Boulders Beach you are allowed to swim alongside the penguins, the only place in the world allowing this. These penguins are remarkably untroubled by humans and continue to invade more beaches where recreational swimming is commonplace. 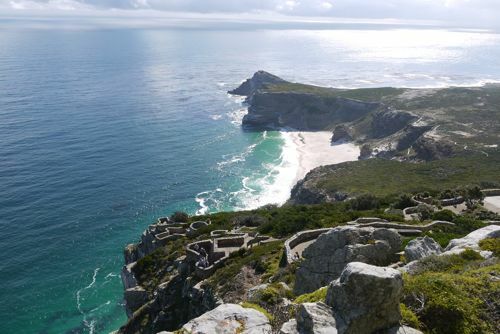 Finally we continued our drive to the southern section of Table Mountain National Park, my favorite- Cape Point and The Cape of Good Hope. We took a ride on the “Flying Dutchman Funicular” to carry us to the upper station at 286 meters above sea level. Once there we climbed the rest of the way to the Point. Rugged rocks and sheer cliffs tower more than 200 meters above the sea and cut deep into the ocean. This piece of jagged land is known for more than it’s amazing beauty. It also has a rich maritime history including both respect and fear. In 1859 the first lighthouse was completed and still stands on the highest section of the peak. In 1911 a new lighthouse was built at a lower elevation (closer to the sea) to increase safety. Often the fog is so heavy that ships can’t see the older lighthouse high above. 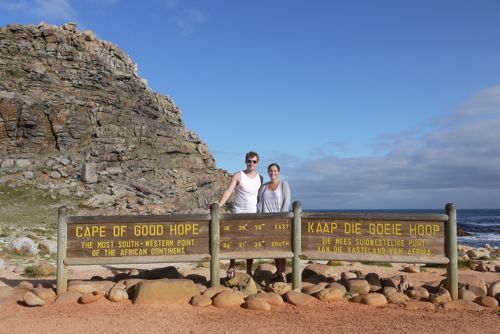 After climbing down from Cape Point we hurried over to The Cape of Good Hope. 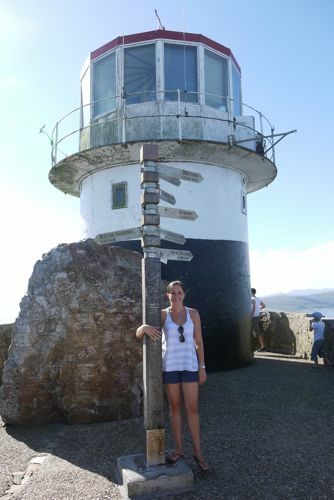 This is mistakenly often referred to as the southern most point in Africa because it was once believed to be the dividing point between the Atlantic and Indian Oceans. It does happen near here, but actually Cape Agulhas is the southernmost point. 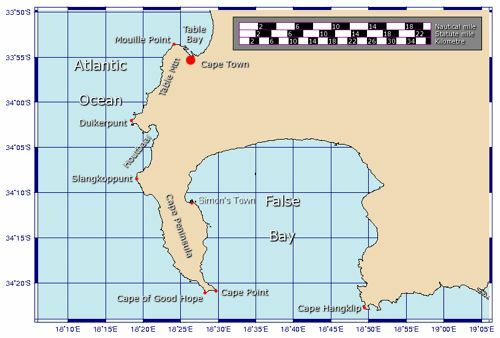 The Cape of Good Hope is the point where ships, when coming from the western coast of Africa, start sailing more eastward than southward. 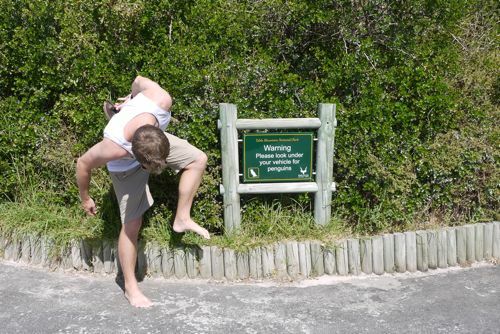 I’ll just stick with the sign and say it’s the most Southwestern point of the African Continent. 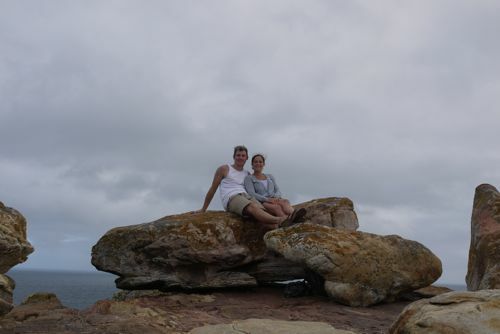 We climbed up the rocky sides and eventually planted ourselves on the boulders at the top of the Cape. It was closing time at the park, so we had it all to ourselves. True Bliss! The following day back in Cape Town, with prebooked tickets in hand to ride the gondola up to the top of Table Mountain, we made our way to the entrance gate; there we were told it wasn’t going to happen, it was closed due to high winds. Bummer. Our final day in Cape Town we made another attempt only to find out there were gale force winds at the top of the mountain. 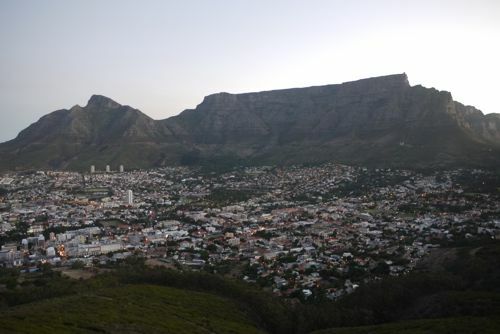 So we got the view from the bottom and even with that were able to understand a bit of what the people of Cape Town so revere and boast about this mountain they love. 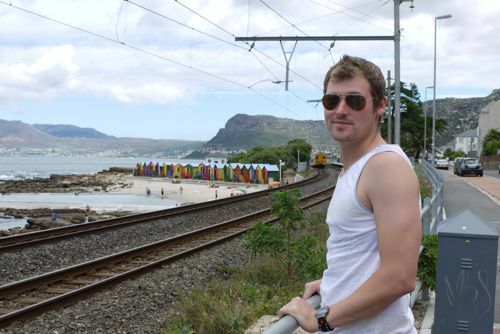 Hi Pat and Alison, Amazing pictures of Cape Town. 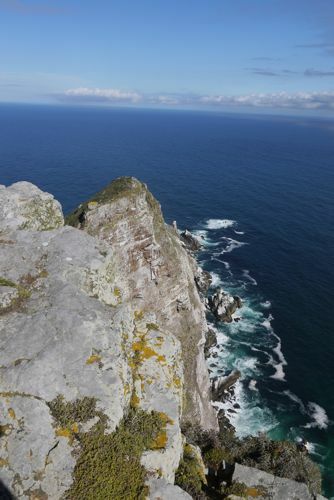 Looking over the Cape of Good Hope is a little different than our view of Lake Ray Hubbard. Thanks for sharing the info and the pictures. I feel like I’m tagging along with you guys on the trip of a lifetime. Always great to hear from you Russ! We were in a cave the other day in NZ and they told us how sometimes musicians will perform there for the acoustics… I was thinking how cool would that be for the Children’s Chorus! Hope you, Karen and all the family are doing well.